David J. Miller was one of founders of the American Historical Society of Germans from Russia (AHSGR) which was organized on September 8, 1968 in Denver, Colorado. Miller served as its first President of AHSGR. Miller's parents were Jacob Miller (born July 2, 1871 in Norka, Russia) and Katharina Margaret Wacker (born December 24, 1876 in Norka). Jacob and Katharina Margaret were married September 30, 1894 in McCook, Nebraska. Miller graduated with a degree from the University of Colorado Law School in 1932. After graduation, Miller worked for the Office of Price Administration (wartime rationing) during World War II and was a civilian legal analyst for General Lucius Clay in Berlin. He and his family were the first family flown into Berlin in the 1948 Airlift. He also served as an attorney at the Nuremberg War Crime Trials. Along the way, he became an early proponent of sustainability, pioneering rammed earth construction (building with soil), developing Alles Acres in Greeley, which was the city’s first rural subdivision, and forming the Central Colorado Water Conservancy District to develop and manage water resources for northeastern Colorado. Miller married Lydia Alles (born February 1, 1908 in Lincoln, Nebraska) and their daughter is Lydia Ruyle - a well known artist. David J. Miller died at age 87 in 1993. 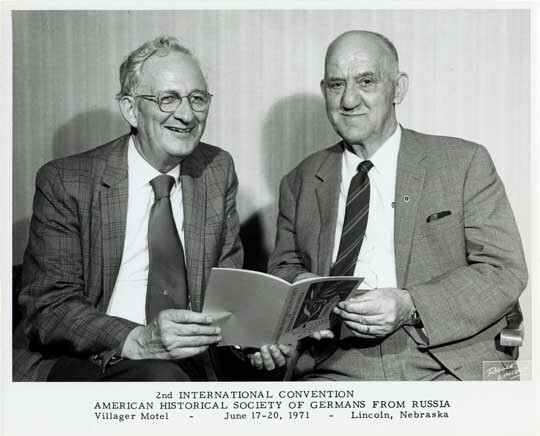 David Miller and Dr. Karl Stumpp at the AHSGR Convention, 1971. Source: NDSU Institutional Repository. "Miller and Ruyle Family Legacies" Amicus, University of Colorado Law School, Winter 2011.